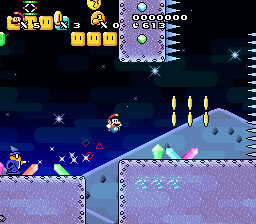 Hello and here's another demo from this awesome hack, this time, featuring 16 levels from Worlds 9 to 11 (Before you ask, i wanted to do a level sampler but i decided to to something different this time). I just saw the trailer, your hack looks amazing! The level design is better than in the first game and its more creative! I'm downloading the demo to play now, keep up the good works, I also will check the other demo with the first 6 worlds too. 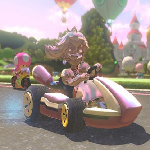 I went on and played up to World 10's castle. I take it that the levels are only hard because of how late-game this demo is. 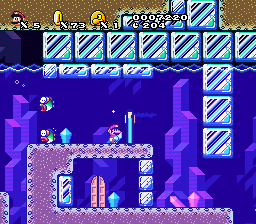 First off, the way these levels look are amazing. The colors and aesthetics are some of the best I've seen. 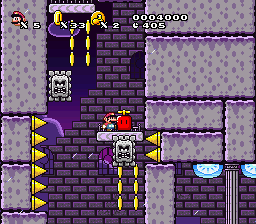 You put in shading in your levels too, and under the bridge the overworld of world 10. I do have some things to say about some of the levels. I'm only saying these things just to express how I feel about certain ideas of yours. 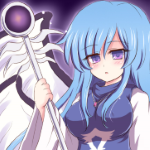 •I hope you aren't actually using that intro in the final version... jokes like those aren't funny or sophisticated. •The wall-jumping is rather finicky for me. Luckily, I didn't need to wall-jump all that much, aside from the tutorial. Also, wall-jumping can randomly glitch out Mario's speed and clip him through a wall and kills him? I had that happen once while playing 9-2. 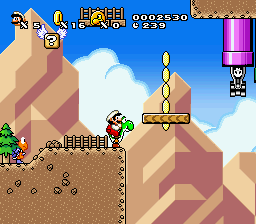 •Speaking of 9-2, the poison smog that slowly kills Mario is clever. 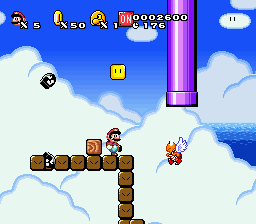 I wish there was a hint telling the player that the smog is bad for Mario however. I didn't know what kept the meter from going down at the time. 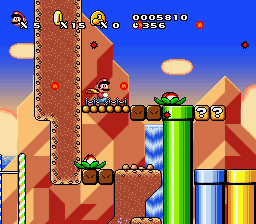 •9-4 (lovely song choice BTW) had a mechanic that I didn't like; Magikoopa puzzles. IMO, they're annoying to pull off, especially when the blocks are above you, and raining down enemies (maybe I'm just impatient). •The fishing boo boss was confusing. From my experience, bosses are usually defeated by attacking them with something. 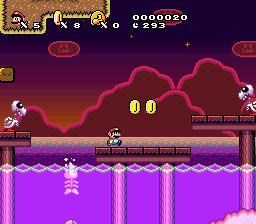 I couldn't figure out this fishing boo boss for the life of me until I heard hitting sound effects randomly. That's when it became clear. 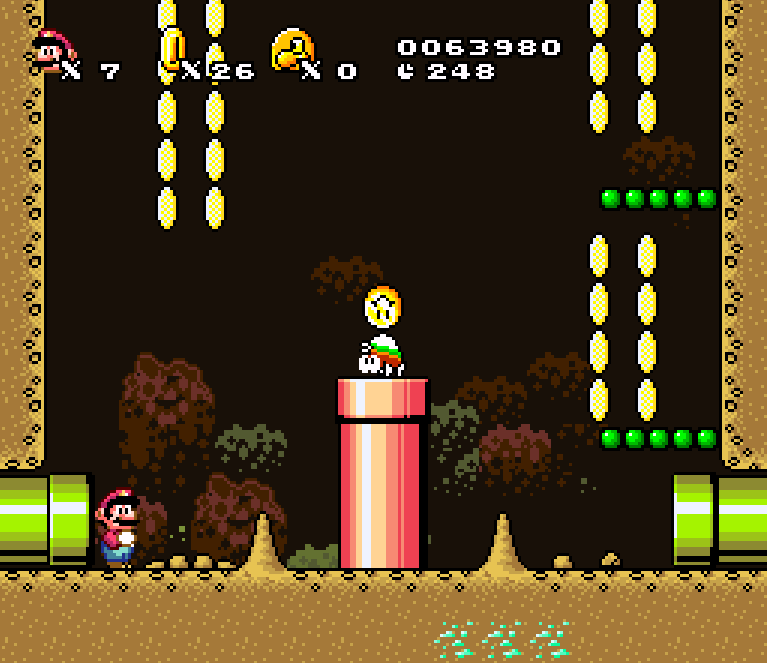 •My favorite level that I played was 10-1, and it is mostly everything after the midpoint that was really good. The vertical section was just the right amount of difficulty, and the homing bullet bills are really good enemies to have for that area. •I'm 99.9% sure this is not meant to be like this. (Level 10-2 BTW). Had a lot of fun playing the demo. The aesthetics are what really makes your hacks special! •Try not to use VLDC 9 music too much for your overworld themes. Speaking of overworld themes, worlds 6 and 11's music don't fit too well in my opinion. •You can skip an entire section in 9-3 by wall jumping to get on top of the cloud ledge to jump to the bullet bill section. You can fix that by putting a ceiling over there. •Try coming up with more creative level names. 9-3 has no bullet bill sections so which level are you talking about? 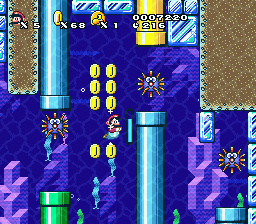 9-5 is supposed to be a harder level since it skips 3 worlds but i still think it's way too hard because there are no power-ups in that level and the mid-point is hidden. I love seeing ambitious projects come to fruition and you seem to be doing quite well. This hack looks amazing and I already look forward to playing it! You have a good balance of gimmicks and original stuff in your levels. It’s obvious that you put a lot of work into it. During the past week, i was working on a new C3 themed level to include on the demo, however due to many school related issues, i took a little too long to finish it. 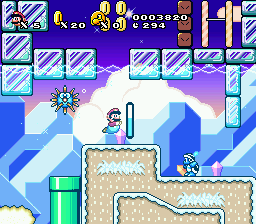 So, as i said before, this is supposed to be inspired on this C3's theme, so i decided to make a level mixing beach elements with ice elements. Since 13-1 was already playable on the demo, you will need to beat that level to unlock this one, unfortunately, you will need to make a new save file and replay the whole thing again because this level was locked on the other version of the demo.